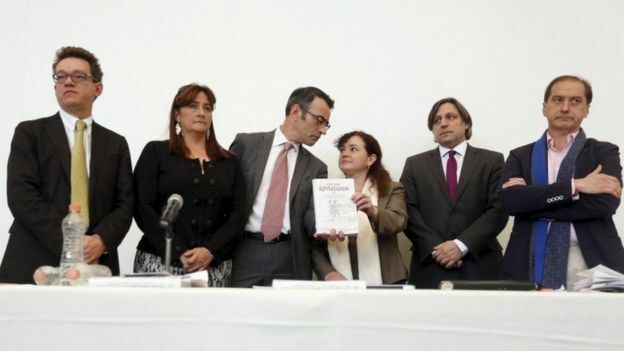 A panel of international experts investigating the disappearance of 43 Mexican trainee teachers in 2014 says the government of President Enrique Pena Neto has hampered its inquiries. In its scathing final report, the experts also dismissed the conclusions of the official inquiry. They said officials failed to pursue the investigative lines they suggested. The case provoked outrage in Mexico, leading to street protests against perceived impunity. “The delays in obtaining evidence that could be used to figure out possible lines of investigation translates into a decision to (allow) impunity,” said the Interdisciplinary Group of Independent Experts (GIEI) in its report. The panel was commissioned by the Inter-American Commission on Human Rights (IACHR). The trainee teachers went missing after taking part in a protest in the south-western city of Iguala, in Guerrero state, in September 2014. 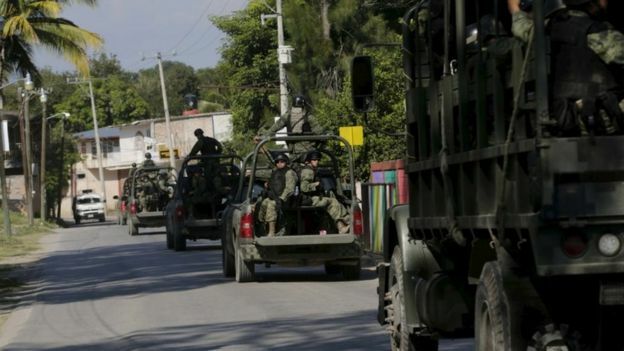 Mexican prosecutors said they were detained by corrupt policemen under the orders of the mayor of Iguala, Jose Luis Abarca, and handed over to a local criminal gang (Guerreros Unidos), who killed the 43 men and burned their bodies in a local landfill site. Relatives have always rejected this version, saying the government was trying to cover up the involvement of senior politicians and army officers in the killings. The work of the independent experts began in March 2015 at the request of the victims’ families – a mission that was approved by the government. Six months later, they issued their first report, contesting the official version of events – a version that the government had called the “historic truth”. This second and final report once again puts the government’s investigation back in the spotlight. The experts say they have found evidence of torture and bribery among many of those who were detained over the students’ disappearance. They also say they were met with obstructionism by authorities which thwarted their efforts to get to the bottom of what happened. More than a year and a half after the students’ disappearance, we are no closer to knowing what really happened that night but one thing’s for certain: the credibility of the Mexican government is more in doubt than ever. 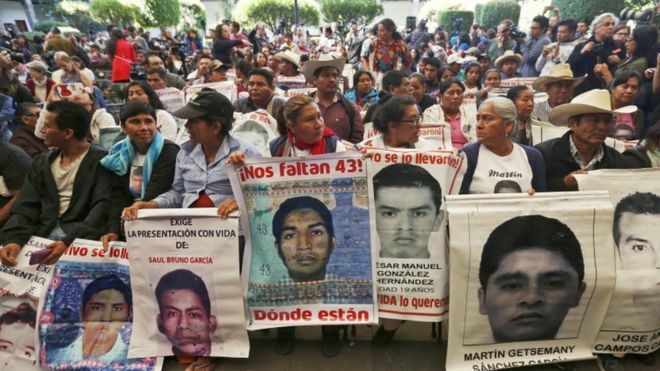 “The independent panel has not found a shred of evidence to show that the bodies were burned at the landfill site in (the town of) Cocula,” said Francisco Fox, a member of the IACHR during a press conference in Mexico City. He said that the remains of 17 people found at the site do not belong to any of the trainee teachers. “There is evidence that the mobile phones of the students were active hours after or, in some cases, days after the time when they would have been burned,” he added. The students had left the town of Ayotzinapa, where they studied, to take part in a protest in Iguala on 26 September 2014. They were complaining against the employment policy of local authorities, whom they accused of discriminating against teachers of a rural background. The students’ protest reportedly disturbed a planned event organised by Maria de los Angeles Pineda, wife of the Iguala mayor Jose Luis Abarca, who had political ambitions. The pair went on the run but were arrested weeks later in Mexico City. Maria de los Angeles Pineda has been charged with involvement in organised crime.